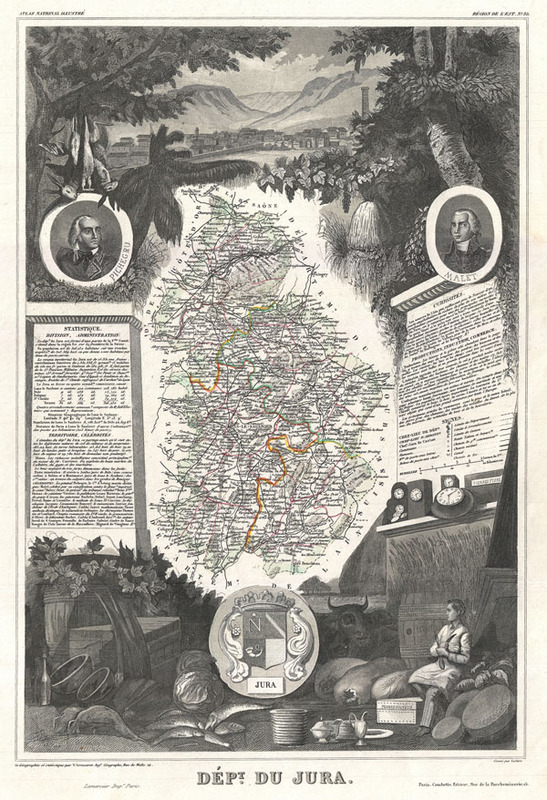 This is a fascinating 1852 map of the French department Jura, France. The Jura wines are very distinctive and unusual, such as Vin Jaune, which is made by a similar process to sherry, developing under a flor of yeast. This is made from the local Savagnin grape variety. Other grapes include Poulsard, Trousseau, and Chardonnay. The whole is surrounded by elaborate decorative engravings designed to illustrate both the natural beauty and trade richness of the land. There is a short textual history of the regions depicted on both the left and right sides of the map. Published by V. Levasseur in the 1852 edition of his Atlas National de la France Illustree.